Department of Pharmaceutics 1, Marathwada Mitra Mandals College of Pharmacy, Thergaon, Pune - 411033, Maharashtra, India. Department of Pharmaceutics 2, PES Modern College of Pharmacy, Nigdi, Pune - 411044, Maharashtra, India. ABSTRACT: Self-microemulsifying drug delivery system (SMEDDS) of Aceclofenac (ACE) was aimed at overcoming the problems of poor solubility. ACE is practically insoluble in water as a result it shows erratic oral absorption and affects the bioavailability. The formulation strategy included selection of oil phase based on saturated solubility studies and surfactant and co-surfactant screening on the basis of their emulsification ability. Ternary phase diagrams were constructed to identify the self-emulsifying region. Labrafac PG 8 (20%) as oil, tween 80 (60%) as surfactant and Polyethylene glycol 400 (20%) as co-surfactant were concluded to be optimized components. The prepared SMEDDS was characterized through its droplet size, zeta potential, emulsification time and rheological determination. The optimized formulation exhibited 98.14 ± 0.34% in-vitro drug releases, which was significantly higher than that of the drug solution. The study confirmed the potential of ACE SMEDDS for oral administration. It was concluded that the SMEDDS formulation approach can be used to improve solubility and dissolution of poorly water-soluble drugs such as ACE. INTRODUCTION: Approximately, one third of the drugs emerging from drug discovery programs are poorly water soluble, presenting several problems when the pharmaceutical scientist developing formulations of such active pharmaceutical ingredients (API). Conventional oral dosage forms for poorly water soluble drugs present the drug in a solid form to the gastrointestinal tract which means the drug has to dissolve in the GI fluids before it can be absorbed. Thus, their rate and extent of absorption is largely dependent on the rate of dissolution. The formulation technique plays an important role in overcoming this short coming of poorly water soluble drugs. According to the Biopharmaceutical Classification System (BCS), two classes of drugs show poor aqueous solubility namely BCS II and BCS IV. BCS II drugs possess poor aqueous solubility but have good permeation properties. BCS class IV drugs are poorly water soluble and poorly permeable. Developing a formulation for a class IV drug is nearly impossible unless the dose necessary is very small. Most of the times, such drugs are withdrawn at its lead optimization stage of drug discovery and reworked to improve its physicochemical properties. Developing a formulation for a drug belonging to BCS II is often challenging as it requires improved dissolution characteristics 1. Self-emulsifying drug delivery system (SEDDS) is defined as isotropic mixture of oil and surfactants or alternatively one or more hydrophilic solvents and co-solvents. Upon mild agitation followed by dilution in aqueous media such as the gastrointestinal (GI) fluid, these systems can form fine oil in water (o/w) emulsions or micro emulsions. Self micro-emulsifying formulations spread readily in the GI tract and the digestive motility of the stomach and the intestine provide the agitation necessary for self-emulsification (SEDDS) typically produce emulsion with a droplet size between 100 and 300 nm while SMEDDS form transparent micro emulsion with a droplet size of less than 50 nm. When compared with emulsions which are sensitive and metastable dispersed forms, SEDDS and SMEDDS are physically stable formulations that are easy to manufacture. SMEDDS can be formulated to give sustained release dosage form by adding polymeric matrix, which is not ionizable at physiological pH and after ingestion in contact with GI fluid forms a gelled polymer making it possible to release the micro emulsified active agent in a continuous and sustained matter by diffusion. Bases of self-micro emulsifying system have been formulated using medium chain triglyceride oils and non-ionic surfactant which are acceptable for oral ingestion. The lipophilic (poorly water soluble) drugs such as nifedipine, griseofulvin, cyclosporine, digoxin, itraconazole, carbamazepine, piroxicam, steroids, ibuprofen, diazepam, etc. are formulated in SMEDDS to improve efficacy and safety. It should be noted that water-in-oil version of SMEDDS has also been investigated. This system can be liquid but also semisolid depending on the excipient’s choice. These are traditionally designed for the oral route. These preparations can be given as soft or hard gelatin capsules for easy administration and precise dosage 2. Materials: Aceclofenac (ACE) was obtained from Wockhardt, Aurangabad. Kolliphore TPGS were a kind gift from BASF Pharmaceutical, Mumbai (India). Labrafac PG 8®, Labrafac liphopile®, Lauroglycol 90® and Capmul MCM® were donated by Gattefosse (India). Cremophor® Rh 40, Castor oil, Seasame oil, Isopropyl myristate, Oleic acid, Olive oil, Soyabean oil, Sunflower oil, Eucalyptus oil, Tween 80, Span 20, Span 80, PEG 400 and Ethanol were purchased from Loba Chemical Pvt. Ltd., Mumbai (India). All other chemicals used were of analytical grade. Screening of Oil: The solubility of ACE in different oils was determined by the shake flask method in order to screen out the oil possessing good solubilizing capacity for ACE. An excess amount of ACE was added to a vial containing 2 ml of oil in each vial. After sealing, the mixture was vortexed using a vortex mixer for 10 min in order to facilitate proper mixing of ACE with the vehicle. Mixtures were kept for 24 h at ambient temperature to attain equilibrium and centrifuged at 3000 rpm for 15 min. Aliquots of supernatant were filtered through a membrane filter (0.45 mm) and diluted with mobile phase. Drug was quantified directly by using a UV-Vis spectrophotometer (1800 Shimadzu, Japan) at λmax 273 nm 3. Screening of Surfactant and Co-Surfactant: Emulsification ability of various surfactants and Co-Surfactant were screened. Surfactant and Co-Surfactant were added to of the selected oily phase. The mixture was gently heated at 40 - 45 °C for 30 seconds to attain homogenization of components. The mixture was weighed and diluted with doubly distilled water to obtain a fine emulsion. The ease of emulsion formation was scrutinized by counting the number of volumetric flask inversions to give a uniform emulsion and was observed visually for relative turbidity. The resulting emulsions were allowed to stand for 2 h and transmittance was observed at 638 nm. The surfactant and Co-Surfactant forming a clear emulsion with fewer inversions and higher transmittance was selected 4, 5. Drug - Excipient Interaction: Fourier transformed infra-red analysis (FTIR) of pure ACE and a mixture of ACE with excipients (mixture of surfactant and co-surfactant and oil phase) was carried out for qualitative compound identification and for drug-excipient interaction studies. ACE and mixtures were analyzed using an 8400 IR Affinity 1- CE, Shimadzu. Japan. All samples were scanned for absorbance over the range from 4000-400 cm-1 3, 4. 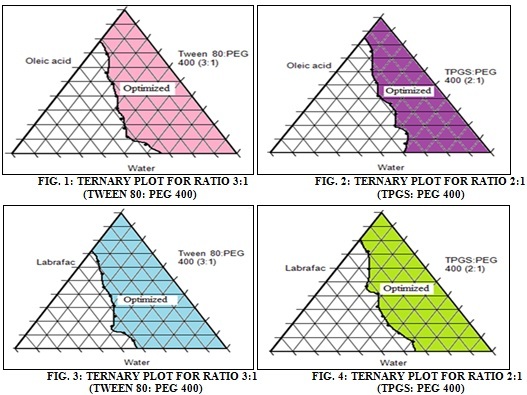 Ternary Phase Diagram: 3, 4, 7, 8 To determine the concentration of SMEDDS components that resulted in maximum micro emulsion existence area, pseudo ternary phase diagrams were constructed employing the water titration method at ambient temperature (25 °C). Mixtures of Tween 80 and PEG 400 (Smix) in different ratios by mass (1:1, 1:2, 2:1, 1:3 and 3:1) were prepared. Mixtures of Kolliphore TPGS and PEG 400 (Smix) in different ratios by mass (1:1, 1:2, and 2:1) were prepared. All the mixtures were mixed with oils (Labrafac PG8 and Castor oil) each separately in different ratios of 1:9, 2:8, 3:7, 4:6, 5:5, 6:4, 7:3, 8:2 and 9:1 with a total volume of 2 ml. The prepared mixtures were vortexed and titrated with water using a micro syringe under gentle agitation. Percent of components at which a clear mixture formed was figured out by constructing a pseudo ternary phase diagram using the PCP - Triangular software for fabrication of ternary plot. Formulation of SMEDDS: From the ternary phase diagram, the ratios of surfactant to co-surfactant was optimized, by varying the ratio of oil to optimized ratio of surfactant to co-surfactant, different formulations were prepared with and without drug. Oil was added to the mixture of surfactant and co-surfactant in ratios (20:80, 25:75, 30:70, 35:65, 40:60, 45:55, 50:50, 55:45 and 60:40) in percent; these formulations were then vortexed for 5 - 10 min with a vortex shaker until a clear solution was obtained 3. Optimization by Factorial Design: 5, 8 The application of mathematical optimization in the pharmaceutical field was first reported by Fonner et al., (1970), using the General factorial method as a constrained optimization technique. Experimental design is an approach in the development and optimization of drug delivery devices. By this method, it is feasible to obtain desired formulation as quickly as possible while avoiding unnecessary experiments. General Factorial Design: A factorial design is used to evaluate two or more factors simul-taneously. The treatments are the combination of levels of factors. The advantages of factorial design over one factor at a time experiment are that they are more efficient and they allow interactions to be detected. Intervention studies with 2 or more categorical explanatory variables leading to a numerical outcome variable are called as “Factorial Design”. Factorial design was constructed to estimate the best amount of Aceclofenac in SMEDDS with combination from three factors (Independent variables) which are type of oil, type of surfactant and ratio of oil to surfactant. High, medium, low levels were selected from the preliminary experimentation. Drug release (Y1), Droplet size (Y2) and transmittance (Y3). Drug Content: 10, 13 Prepared liquid SMEDDS containing Aceclofenac (equivalent to 100 mg) was added in the volumetric flask containing methanol and mixed it well with mechanical shaking and inverting volumetric flask 2 to 3 times. Then from this solution appropriate amount of solution was taken out and then diluted appropriately with methanol and drug content was determined using UV Spectrophotometry (1800, Shimadzu, Japan) at λmax 273 nm. Centrifugation and Thermodynamic Stability Studies: 3, 4, 7, 11, 13 Formulations were centrifuged at the 5000 rpm for 30 min and observed for phase separation, creaming and cracking. The formulations which showed maximum stability (no creaming, cracking, phase separation) were selected. To overcome the problem of metastable formulation, thermodynamic stability tests were performed. Those formulations that did not show any phase separation in centrifugation were taken for the heating and cooling cycle at temperature of 4°C and 45°C for 48 h were done. The formulations were then observed for phase separation. Ease of Emulsification: 4, 6, 11, 12 The mixture, 50 mg, was accurately weighed and diluted to 50 ml using double distilled water to yield fine emulsion. The ease of formation of emulsions was noted by noting the number of flask inversions required to give uniform emulsion. The resulting emulsions were observed visually for the relative turbidity. The emulsions were allowed to stand for 2 h and their transmittance was measured at 638 nm by UV - double beam spectrophotometer (1800, Shimadzu, Japan) using distilled water as blank. Globule Size Determination: 3, 4, 8, 10, 12, 13, 14 Globule size was determined for all thirty three formulations with drug. A 0.5 ml of the homogeneous mixture was measured and diluted up to 100 ml with distilled water in beaker of 100 ml. Then beaker was placed on magnetic stirrer for 5 min. Then samples were taken for globule size determination. Globule size of the resulting dispersions was determined by Zetasizer Delsa™ Nano (NX0088 Beckman Coulter). Phase Separation Study: 15 Each liquid SMEDDS formulation (0.5 ml) was added to 100 ml volumetric flask and diluted with phosphate buffer pH 7.4. After inverting the volumetric flask for 3 - 4 times, each mixture was stored for 2 h and phase separation was observed visually. Polydispersity Index (PDI): 3, 7, 13 PDI measurement was carried out by dynamic light scattering with a Delsa™ Nano (NX0088 Beckman Coulter). All samples were subjected to sonication prior to PDI determination. Emulsification Time: 8, 11, 13 Emulsification time of the SMEDDS formulations on the basis of droplet size was assessed on a USP type II dissolution apparatus (TDT 08, Electrolab, India). Formulation (800 mg) was added dropwise to 500 ml of distilled water maintained at 37 ± 0.5 °C. Gentle agitation was provided by a standard stainless steel dissolution paddle rotating at 50 rpm. The emulsification time was assessed visually. In-vitro Dissolution Study in Phosphate Buffer pH 7.4: In-vitro dissolution of liquid SMEDDS formulations was carried out by using USP type I dissolution test apparatus (basket type). The liquid SMEDDS were filled into size ‘0’ capsules batches and kept in the dissolution vessel. The dissolution fluid (900 ml) was maintained at 37 ºC ± 0.5 ºC. The speed of the stirrer was adjusted to 50 rpm. An aliquot of 1 ml was withdrawn by means of a pipette at predetermined intervals for a period of 10 min and diluted up to 10 ml using phosphate buffer pH 7.4. Same quantity of fresh fluid equilibrated at 37 ºC ± 0.5 ºC was replaced. The aliquots were assayed spectrophotometrically at a maximum of 273 nm (1800, Shimadzu, Japan). In-vitro Drug Diffusion Study in Phosphate Buffer pH 7.4: 7 In-vitro drug release study was carried out using a Franz diffusion cell. The receptor chamber was filled with mixture of phosphate buffer pH 7.4. 0.45 μ cellulose acetate membrane was placed between donor and receptor compartment. One gram of drug formulation was placed on the membrane surface in the donor compartment. Samples of 2 ml were withdrawn from sampling port at predetermined time points of 0, 10, 20, 30, 40 min and same quantity was replenished with fresh receptor determine the amount of ACE released. Released was calculated and plotted against time. Rheological Analysis: 3, 10, 11 SMEDDS (1 ml) was subjected to viscosity determination. It was diluted 10 times and 100 times with distilled water and then viscosity was measured using a Brookfield viscometer (Amkette Analytics Ltd., Mumbai, India) and assessed visually for any phase separation. Zeta Potential: 3, 7, 13 SMEDDS formulations (F1-F15 and Fk1-Fk18) optimized on the basis of droplet size and PDI determined using a Zetasizer Delsa™ Nano (Beckman coulter). These formulations were subjected to sonication followed by dilution with excess (100 times) double distilled water and then analysed. The zeta potential of diluted SMEDDS was determined. Charge on emulsion droplets and their mean zeta potential values (± SD) were obtained. Drug - Excipients Compatibility Study: This was carried out by FT-IR analysis of pure drug, oils and surfactants and their formulations to study the possible interaction between drug and polymers using Shimadzu 8400 IR Affinity 1- CE. Differential Scanning Calorimetry of Drug Sample: 10 The physical state of Aceclofenac was characterized by the differential scanning calorimetry. The samples (about 3.0 mg) were placed in standard aluminium pans, and dry nitrogen was used as effluent gas (10 ml / min). All samples were scanned at temperature speed of 10 ºC / min and the heat flow from 50 to 250 ºC using Differential Scanning Calorimeter (Mettler Toledo DSC-1 Thermal Analyzer). Solubility Studies: The self-micro emulsifying formulations consisted of oil, surfactants, co-surfactants and drug should be a clear, monophasic liquid when it is introduced into aqueous medium and should have good solvent properties to present the drug in solution. So in the formulation of SMEDDS the selection of suitable oil, Surfactant and co surfactant plays a key role to potentiate the solubility and drug loading. Solubility Determination of Aceclofenac in Different Oils: Solubility studies were aimed at identifying suitable oil phase for the development of SMEDDS for Aceclofenac. Identifying the suitable oil, having maximal solubilizing potential for drug under investigation is very important to achieve optimum drug loading. Solubility studies clearly indicated that amongst the various oily phases that were screened, Oleic acid and Labrafac PG8 could solubilize the 25.18 mg per ml and 86.85 mg per ml of drug. Oleic acid and Labrafac PG8 is selected as an oil component which was promoted self dispersibility of lipid formulations and have good solvent capacity for drugs. The selection of surfactant or co-surfactant in the further study was governed by their emulsification efficiency rather than their ability to solubilize Aceclofenac. Solubility of Aceclofenac in Different Surfactants and Co-surfactants: Previous studies have indicated that Tween 80 and Kolliphore TPGS improve intestinal absorption of drugs. Among surfactants and co surfactants tested Tween 80, Kolliphore TPGS and Polyethylene glycol 400 has shown maximum solubility of 425.91 mg/ml, 98.65 mg/ml and 117.20 mg/ml respectively. The results revealed that Tween 80 showed 98.76% transmittance and 19 inversions and Kolliphore TPGS showed 92.78% transmittance and 23 inversions and PEG 400 showed 98.76% transmittance and 26 inversions whereas other surfactants and co-surfactants showed less transmittance and more inversions. Hence Tween 80, Kolliphore TPGS and PEG 400 were selected for further study. Construction of Pseudo - Ternary Phase Diagrams: Phase diagrams were constructed to figure out the maximum microemulsion area with optimisation of the best ratio of surfactant and co-surfactant (1:1, 1:2, 2:1, 1:3 and 3:1) to each system and composition of excipients for developing optimal SMEDDS. It was observed that the mixture of surfactant and co-surfactant in ratio 3:1 showed the maximum microemulsion area for system ALTWP and AOTWP Fig. 1 and 2. That the mixture of surfactant and co-surfactant in ratio 2:1 showed the maximum microemulsion area for system ALTPP and AOTPP Fig. 3 and 4 therefore 2:1 was selected as the optimal ratios. Drug Content: The percentage drug content was increases as the surfactant concentration increases due to the enhanced solubilizing capacity of surfactants. The drug content uniformity in the optimized formulation (F8) was found to be 99.32% indicating uniform drug dispersion in formulation. Phase Separation Study: F1 to F15 and Fk1 to Fk12 formulations were stable for two hours on phosphate buffer pH 7.4 and distilled water. No phase separation occurred for any formulation. Hence all the formulations were subjected to further evaluation. Centrifugation and Thermodynamic Stability Studies: The formulations which were stable in centrifugation study and those formulations that survived thermodynamic stability tests were selected for further studies. The formulations F8 to F15 showed maximum stability (no creaming, cracking, phase separation) were selected for further study. Emulsification Study: The ease of emulsification or rate of emulsion formation was measured by UV-spectrophotometer. As the surfactant concentration increases the ease of emulsification also increases by getting decrease in the transmittance. As the concentration of the oil increases, the transmittance as well as the ease of emulsification decreases. The transmittance of formulations was found less it may be due to more surfactant concentration this might be due to difference in CMC concentration of surfactant. Transmittance study gives only rough idea about the characteristics of resultant micro emulsion Table 1. Globule Size Determination: It has been reported that particle size distribution is one of the most important characteristics affecting the in vivo fate of emulsions. Droplet size is a crucial factor in self-emulsification performance, because it determines the rate and extent of drug release as well as drug absorption. It has been reported that small size of emulsion droplets may lead to more rapid absorption, thereby improving the bioavailability. The average size of the resultant micro emulsion after dilution was found to be 23 to 1760 nm Table 2, which was highly desirable, indicating that the system had narrow size. Furthermore, a decrease in the droplet size reflects the formation of a better packed film of the surfactant at the oil-water interface, thereby stabilizing the oil droplets. Results revealed that formulations F8 to F15 solubilized the therapeutic dose of Aceclofenac, but among these formulations Fk6 and Fk9 had droplet size larger than 1300 nm. While formulations F8 was followed the criteria of micro emulsion by having the droplet size lower than 23.45 nm, indicating the uniformity of particles as shown in Fig. 5. Hence, formulations F8 were selected for further evaluation studies of zeta potential. Polydispersity Index (PDI): Formulation F8 to F15 showed lower droplet size than other formulation. Hence formulation F8 to F15 were selected for PDI study, showed in Table 3. Formulations F8 followed the criteria of micro emulsion by having the PDI lower than 0.19 respectively, indicating the uniformity of particles. Hence, formulations F8 were selected for further evaluation studies of zeta potential Table 4. Emulsification Time: It has been suggested that the mechanism of self-emulsification involves attrition of a fine cloud of small droplets from the surface of large droplets, instead of progressive reduction in droplet size 9. Table 5 shows that, as the concentration of surfactant increases, the spontaneity of emulsification process increases. This may be due to capacity of Tween 80 in reducing the interfacial tension moreover, co-solvent further lower the interfacial tension between O/W interface and also influenced interfacial film curvature. The results divulged that F8 showed minimum emulsification time of 51 ± 1 s while other showed higher emulsification time of 55 ± 2 and therefore F8 was found optimized. In-vitro Drug Release Study: Drug release from the SMEDDS formulation (F8) was found significantly higher as compared to of other formulations. It could be suggested that the SMEDDS formulation resulted in spontaneous formation of a micro emulsion with a small droplet size may lead to higher absorption and higher oral bioavailability. The maximum drug release and diffusion (F8) was found to be 98.14 ± 0.6 and 87.68 ± 0.6 respectively. All the formulations were subjected to an in vitro dissolution study. The release profiles showed that the drug release from formulation F8 was highest compared to other formulations and found significantly enhanced compared to the standard drug solution (p˃0.0001). Comparative in vitro studies between pure drug and optimized SMEDDS formulation were done using dissolution apparatus and diffusion cell Fig. 6. Rheological Analysis: Viscosity of the formulations when diluted 100 times was showed in Table 6. Formulation Fk17 and Fk18 was highest viscosity as they contain higher concentration of surfactant and co-surfactant. Viscosity of formulations depends upon type of surfactants. Viscosity of the F8 formulation was found to be 9 ± 1 cps. Zeta Potential: Zeta potential of the selected formulation (F8) when diluted 100 times was found to be -35.44 mV respectively. As formulation F8 showed the highest zeta potential value, it is the most stable micro emulsion formulation Fig. 7. FT-IR Analysis: The IR spectrum of Aceclofenac was given in Fig. 14. FT-IR analysis of all the excipients used in the formulation and the drug were studied for the interaction of the excipients and the drug in the final formulation. 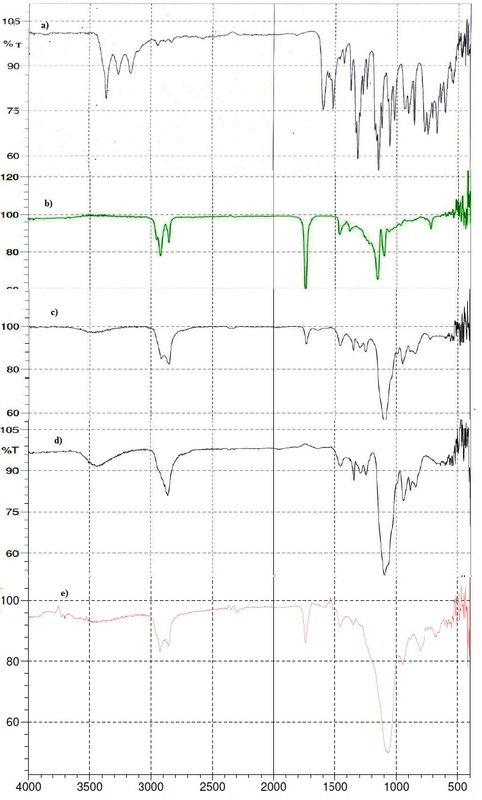 The basic peaks of Aceclofenac were observed at 3321.42, 2978.09, 1720.50, 1471.69, 1290.38, 989.13, 754.17 cm-1 and same peaks were observed without any deviation in the spectra of Labrafac PG, Tween 80 and PEG 400 containing formulations Fig. 8. This shows that there was no drug - excipient interactions. Thus it was concluded that, there is no possible interaction between the drug and excipients, hence the drug and excipient were compatible and stable. Differential Scanning Calorimetry of Drug: DSC thermogram of Aceclofenac showed sharp endothermic peak of fusion. Differential scanning calorigraph of pure ACE represented sharp endothermic peak at 152.90 °C and DHt = -134.63 J/g Fig. 9. SMEDDS presented no such peak which indicated change in melting behaviour of drug and inhibition of crystallization thus, it can be confirmed that drug was solubilized into excipients of SMEDDS. Analysis Process of Drug Release: The Model F- value of 78.73 implies the model is significant. There is only a 0.01% chance that a “Model F-value” this large could occur due to noise. Values of “Probe > F” less than 0.0500 indicate model terms are significant. The statistically significant relationship between the dependent and independent variables are constructed based on the ANOVA results Table 8. The effect of type of oils (X1), type of surfactants (X2) and ratio of oil (X3) when drug release (Y1) is considered as response. The low height Green bar shows the minimum drug release which have less surfactant: co-surfactant ratio (20%) and higher oil concentration (80%). Fig. 10 shows the 3D surface graph of surfactant: co-surfactant ratio and higher oil concentration when percentage amount of Aceclofenac release after 40 min from SMEDDS is considered as the response. The highest red bar shows the maximum drug release which is due to higher surfactant: co-surfactant ratio (80%) and lower oil concentration (20%). The highest amount of Aceclofenac is released with maximum surfactant: co-surfactant ratio (80%) and lower oil concentration (20%). From the obtained results it can be concluded that an optimal Aceclofenac loaded SMEDDS formulation composed of labrafac PG8 (20%), Tween 80 (60%) and PEG 400 (20%) F8. The “Pred R-squared” of 0.8596 is in reasonable agreement with the “Adj R - squared” of 0.8793. 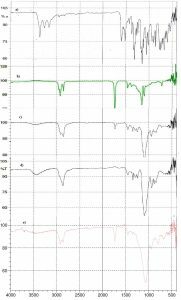 “Adeq Precision” measures the signal noise ratio. A ratio greater than 4 is desirable. The ratio of 19.225 indicates an adequate signal. Analysis Process of Droplet Size: The Model F-value of 475.20 implies the model is significant. There is only a 0.01% chance that a “Model F-value” this large could occur due to noise. Values of “Prob >F” less than 0.0500 indicate model terms are significant. In this case A, B is significant model terms. The statistically significant relation-ship between the dependent and independent variables are constructed based on the ANOVA results. Table 10 Increasing the surfactant to co-surfactant concentration shows the decrease in the droplet size. The highest Green bar shows the maximum droplet sizes which have less surfactant: co-surfactant ratio (20%) and higher oil concentration (80%). Fig. 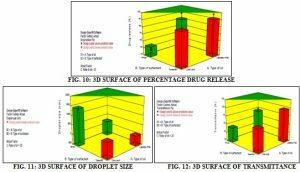 11 shows the 3D surface graph of surfactant: co-surfactant ratio and higher oil concentration when droplet size of SMEDDS is considered as the response. The low height red bar shows the minimum droplet size which has higher surfactant: co-surfactant ratio (80%) and lower oil concentration (20%). The lower droplet size of SMEDDS with maximum surfactant: co-surfactant ratio (80%) and lower oil concentration (20%). From the obtained results it can be concluded that an optimal Aceclofenac loaded SMEDDS formulation may be composed of labrafac PG8 (20%), Tween 80 (60%) and PEG 400 (20%) F8. The “Pred R-squared” of 0.9747 is in reasonable agreement with the “Adj R-squared” of 0.9780. “Adeq Precision” measures the signal noise ratio. A ratio greater than 4 is desirable. The ratio of 47.66 indicates an adequate signal. CONCLUSION: In the present study, the poorly water-soluble ACE was formulated into a beneficial and patient compliant self-micro emulsifying system to improve its solubility. SMEDDS of ACE was prepared and optimized by using parameters such as droplet size, PDI, zeta potential, in-vitro release data. Optimal SMEDDS consisted of Labrafac PG 8 as the oil phase, Tween 80 as surfactant and PEG 400 as co-surfactant. Permutation of all three components, i.e., oil / surfactant / co-surfactant in the ratio 20:60:20, formulates SMEDDS with droplet size 23.45 nm, PDI 0.1814 and zeta potential -35.44 mV. This optimised SMEDDS showed good in vitro release, which is increased by more than 90% when compared to pure drug solution. From entire studies, we concluded that the developed SMEDDS formulation of ACE shows improve solubility as compared to pure ACE. Thus our studies exemplified the promising use of the self-micro emulsified drug delivery system to dispense poorly water-soluble drugs by oral route. ACKNOWLEDGEMENT: I deeply convey my special thanks to Dr. Manohar J. Patil, Principal and Management of Marathwada Mitra Mandal’s College of Pharmacy, Thergaon (Kalewadi), Pune - 411033, for support, and making available all required laboratory and library facilities to me to carry out my research work successfully. I am thankful to BASF Pharmaceutical, Mumbai India for providing the Kolliphore TPGS also thankful to Gattefosse, Mumbai, India for providing Labrafac. Gadhe LT, Kapadi SV, Bachkar B, Gandhi M, Talele S and Chaudhari GN: Recent patent review on self microemulsifying drug delivery system. World Journal of Pharmaceutical Research 2015; 4(3): 965-979. Thakare P, Mogal V, Borase P, Dusane J and Kshirsagar S: A review on self-emulsified drug delivery system, Pharmaceutical and Biological Evaluations 2016; 3(2): 140-153. Goyal U, Arora R and Aggarwal G: Formulation design and evaluation of a self-micro emulsifying drug delivery system of Lovastatin, Acta Pharm 2012; 62: 357-370. Meena Ak, Sharma K, Kandaswamy M, Rajagopal S and Mullangi R: Formulation Development of an Albendazole self-emulsifying drug delivery system (SEDDS) with enhanced systemic exposure, Acta Pharmaceutics 2012; 62: 563-580. Kallakunta VR, Bandari S, Jukanti R, Reddy P and Reddy V: Oral Self Emulsifying Powder of Lercanidipine Hydrochloride, Formulation and Evaluation. Powder Technology 2012; 221: 375-382. Anna M, Sierra V and Beatriz CN: Design and Optimization of Self-Nano-Emulsifying Drug Delivery System (SNEDDS) for Enhanced Dissolution of Gemfibrozil. 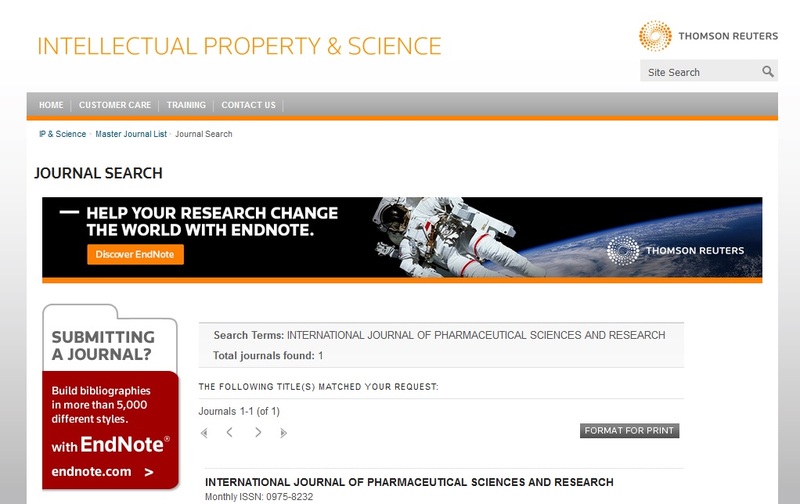 International Journal of Pharmaceutics 2012: 161-175. Narkhede RS, Gujar KN, Gambhire VM. Design and Evaluation of Self‑Nanoemulsifying Drug Delivery Systems for Nebivolol Hydrochloride. Asian Journal of Pharmaceutics, 2014; 8(3): 200-209. Laddha P, Suthar V and Butani S: Development and optimization of self microemulsifying drug delivery of domperidone, Brazilian Journal of Pharmaceutical Sciences 2014; 50(1): 91-100. Truong DH, Tran TH, Ramasamy T, Choi JY, Lee HH, Moon C, Choi HG, Yong CS and Kim JO: Development of solid self-emulsifying formulation for improving the oral bioavailability of Erlotinib. Aaps Pharm Sci Tech 2016; 17(2): 466-473. Bhagwat DA and D’souza JI: Formulation and evaluation of solid self micro emulsifying drug delivery system using Aerosil 200 as solid carrier. 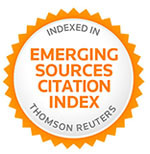 International Current Pharmaceutical Journal 2012; 1(12): 414-419. Patharkar P and Tarkase KN: Development and evaluation of solid self emulsifying drug delivery system of olmesartan medoxomil by using adsorption to solid carrier techniques. J. Drug Res. Tech 2016; 6(3): 209-227. Yeom DW, Song YS, Kim SR, Lee SG, Kang MH, Lee S and Choi YW: Development and optimization of a self-micro-emulsifying drug delivery system for atorvastatin calcium by using d-optimal mixture design. International Journal of Nanomedicine 2015; 10: 3865-3878. Padia N, Shukla A and Shelat P: Development and Characterization of Fenofibrate Self micro-emulsifying Drug Delivery System (SMEDDS) for Bioavailability Enhancement. Bulletin of Pharmaceutical Research 2015; 5(2): 59-69. Karim FT, Kalam A, Anwar R, Miah MM, Rahman MS and Ashraful SMI: Preparation and evaluation of SEDDS of simvastatin by in vivo, in vitro and ex vivo Drug development and industrial pharmacy 2014; 41(8): 1-5. O’ Driscoll MC: Lipid based formulations for intestinal lymphatic delivery. European Journal of Pharmaceutical Sciences 2002; 15: 405-415. Ratnaparkhi MP and Chaudhari PD: Design, development and characterization of self micro emulsifying drug delivery system for Aceclofenac. Int J Pharm Sci & Res 2018; 9(9): 3815-26. doi: 10.13040/IJPSR.0975-8232.9(9).3815-26.